People around the world rely on Domtar products every single day. We make those products at facilities around the world, and each facility is as unique as the people who work there. The second installment in our series of facility profiles features the Nekoosa Mill in Nekoosa, Wisconsin. The city, the name of which comes from a Native American word meaning “running water,” is located on the Wisconsin River. 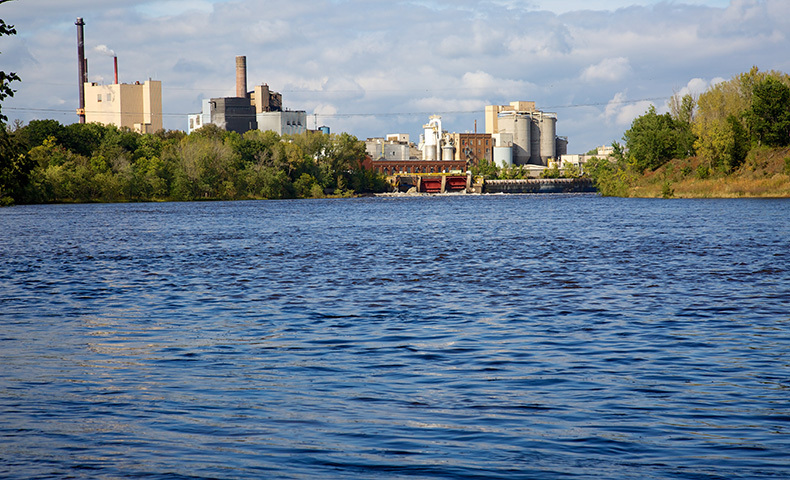 The river is an important driver for the local economy, and it is essential to our mill’s productivity. Papermaking in Nekoosa dates back to 1883, when the first sheets of paper rolled off machines at the Nekoosa Paper Company. With more than 440 employees, the Nekoosa Mill is the city’s largest employer, and it has an economic impact of more than $350 million in the region. The mill makes more than 675 different grades, colors and basis weights of paper on three machines. These papers have thousands of applications, including receipts and labels, bacon board and fast food wrap, sugar pouches, sticky paper, books and fluorescent sheets. While the mill is most widely known for the paper it makes, it also generates other important products for the market, including pulp and biomaterials. The mill sells wet lap northern bleached softwood kraft pulp, which it supplies to Domtar’s Rothschild Mill 48 miles away in Rothschild, Wisconsin. Making the most of raw materials used at the Nekoosa Mill is important to the mill’s economic efficiency and its environmental promise. Biomaterials such as turpentine and tall oil are often byproducts of the papermaking process; they are sold to refiners and manufacturers, who use the materials to make flavors, fragrances, soaps, lubricants, inks and other products. Bark, another biomaterial, is transferred to our Rothschild Mill, where it’s used in a biomass boiler to generate steam for the mill and electricity for a utility partner. The Nekoosa Mill also owns electrical power-generating assets, including steam turbines, and it sells surplus electricity generated by the four hydroelectric facilities on the mill’s river dams and its steam generators. But what we make at Nekoosa isn’t the only product we produce; we also create community involvement. Mill colleagues support education efforts at local schools and community centers, as well as initiatives to eliminate hunger and to help victims of domestic violence. In addition, residents of Nekoosa can enjoy recreational activities on mill property near the river through long-term agreements with the city. Regional television viewers enjoyed a closer look at our Nekoosa Mill on Around the Corner with John McGivern, a PBS show that travels Wisconsin to highlight businesses, homes and people. It features cities in a get-to-know-you style. An April episode on the region around Wisconsin Rapids stopped by the Nekoosa Mill during the production of bright yellow paper. Read about the Dryden Pulp Mill in the first installment in our facility profiles. You can learn even more about the Nekoosa Mill and other Domtar facilities at the Domtar Paper Trail, an online transparency tool that shares the environmental, social and economic effects of Domtar’s operations.